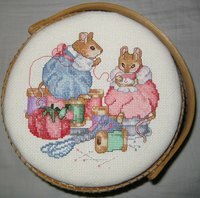 Counted cross stitch may be worked on many types of fabric. Crafters select aida cloth for its smooth surface and even threads. Within the category of aida cloth exist variations, including fiddler or fiddler’s cloth. Cotton forms the basis of aida cloth. Some versions are 100 percent cotton. Other varieties include different fibers. Both fabrics feature evenly spaced threads duplicated across length and width. This spacing provides the basis for the decorative crossed stitches. Choose fabric by the thread count or squares per inch. The smooth, even spacing of threads in aida cloth makes it a neutral canvas for cross stitched art. Expect a more country feeling from fiddler cloth as its slightly irregular threads offer an interesting work surface. Aida cloth accepts fabric dye readily. Look for aida in nearly any color of the rainbow. Fiddler cloth is a more rustic version, coming in tan shades with darker nubs within the fabric. Aida cloth is better for use on formal projects. Fiddler cloth works well for informal or whimsical projects, imparting a rural look or a feeling of age.